We have a busy week next week. I'll be sharing my list of Odds On Jockeys and we also have a three day meeting at Chester. Chester is a course with a known draw bias and I'll have something to say about that! For today I just want to tell you about a couple of great services. VB Daily are now mailing out on weekdays to let registered users know where their best bet of the day is running and on day two of doing this their best bet won at 20/1 early odds, 16/1 SP. 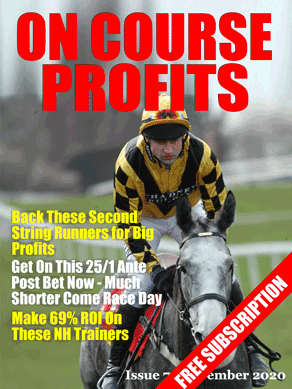 The other service I want to mention is a very professional and profitable tipping service that only bets in top quality races. You amy have seen a mail on this yesterday, but if you missed it there is a half price offer on Cleeve Racing when you sign up for their flat service. As you read this I'm pitching a tent somewhere in Wales for a 2 week break with my 2 teenage daughters. To keep you entertained while I'm away I've put together a series of articles that I hope you will find informative and that will help you make your betting a little more profitable. This week I'm going to be looking at various race types and the types of horses that win them. A claiming race is a race where a horse may be claimed for a fee of at least £2000 whether the horse wins or not, a maximum claiming price is also set for the race and horses which are offered below that price will carry less weight than a more expensive rival. In effect the trainer is self-handicapping his own horse and can increase its chance of winning; in theory the lower the weight a trainer allocates his horse the more chance it will have of winning. These races have an unfair reputation as poor betting mediums as they are usually contested by low grade horses. Although that is generally true for younger horses, the reality is that the 4yo plus races can offer some of the best betting opportunities around. Most of the runners are fully exposed and often entered in at an advantageous weight and statistically they are one of the most reliable races to follow. A trainer will enter a horse in a claimer for basically one of two reasons, the horse is poorly handicapped or the trainer wishes to get rid of the horse. You should therefore be wary of runners who have had less than half a dozen runs and have been dropped into a claimer, the chances are the trainer has realised the horse has limited ability and has lost faith in him. Older horses who have lost some of their ability and are now unlikely to win a handicap are often dropped into claimers and Dandy Nicholls is probably the best exponent of this and how best to allocate an appropriate weight for his runners. In fact if you look at the figures over the long term you could just back all his runners in Claimers and make a level stake profit. But it would have been a bumpy ride with some years much better than others. When betting in Claimers it's best to concentrate on 4 year old and older horses. Apply that rule to Dandy and the profits increase. Weight is vital in these races and just under half of all Claimers are won by the top two in the weights and well over 80% of all winners come from a runner from the top six in the weights. It would appear that you can’t make a silk purse out of a sow’s ear and if a horse lacks ability it will struggle to win no matter how low a weight it carries. The strike rate is pitifully poor at the lowest weights and gradually rises with a pleasing symmetry for runners carrying 105lb or less all the way up to 140lb (10 stones) where the strike rate is 23% and we would really only recommend backing any horse carrying less than 8-7 under exceptional circumstances. The optimum weight would appear to be 131 -140lb (9-5 to 10 stone) and if a runner within that weight range is also one of the top two in the weights then it should be given serious consideration. Class droppers also have a good record in these low class races and the bigger the drop in class, then statistically, the better the chance of winning. Even in this low grade of racing it is important that a horse has shown that it has a winning mentality, a horse with a win to its name is far more likely to win than a maiden and if it has a good run to its name from its previous three runs then statistically the horse is more likely to win. Fillies, Mares and Colts also have an inferior record. Went off 3rd favourite on debut in 5f Ascot maiden in May but faded to finish 7th of nine. John Gosden’s juveniles have a track record of improving for their debut run and this filly has a decent pedigree and it will be no surprise if doing much better as she gains experience.